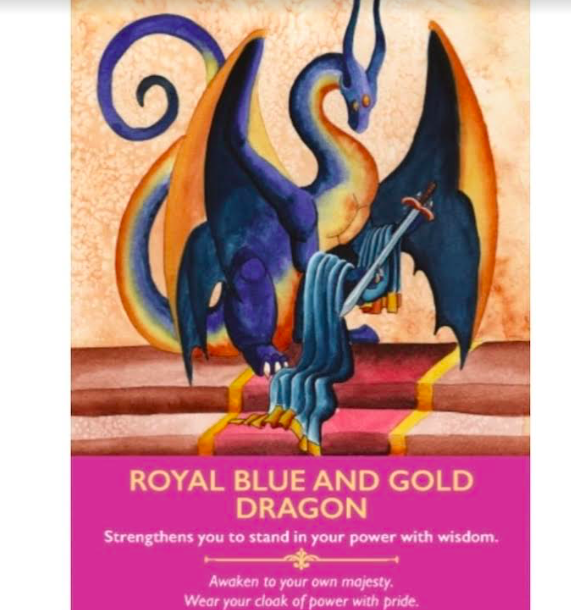 The card that popped up for you today was, Royal Blue and Gold Dragon, from the oracle card deck Dragon Oracle Cards, by Diana Cooper. Sending you love and light A royal blue and gold dragon is lighting up the gifts and talents you carry in your aura. It is breathing courage, support and dignity into you so that you can wear your cloak of power and wisdom with pride. Most important of all, it is awakening you to who you truly are. It is enabling you to radiate your special light. This dragon is always with you. It holds your Sword of Truth so Archangel Michael can enable you to speak and act with truth and honour at all times. It roars at those who try to diminish you and befriends those who empower you. You have all the support you need to teach divine majesty by example.